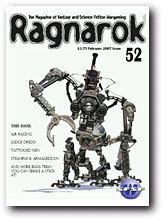 Issue 52 of Ragnarok the SFSFW‘s journal of fantasy and science fiction wargaming landed care of the Post Office today. My first Rag cover. It wasn’t a picture I’d done expecting it to be used on the cover but John liked it and wouldn’t let me fiddle with it. I’ve got a couple more illustrations inside on David Crook’s article &Inventing Armageddon – An Overview". I’ve only had a chance to take a quick glance but it looks to be a pretty good issue. Edit: I’ve posted a larger version of the steam mech picture now. This is pretty cool. Getting published is always nice. "Not letting you fiddle with it" means you did something so very good out the bag, that's pretty damned fine work. You should be proud. is there anywhere to see a bigger image of it to see the details?